The former Gates Rubber plant will be a 40 acre transit-oriented development with 2,500 housing options with at least 250 affordable units. A million square feet of office space, retail space, restaurants and a park are all planned. A pedestrian bridge over the Platte River and railroad will provide better connectivity to the west side. More info on the plan can be found here. 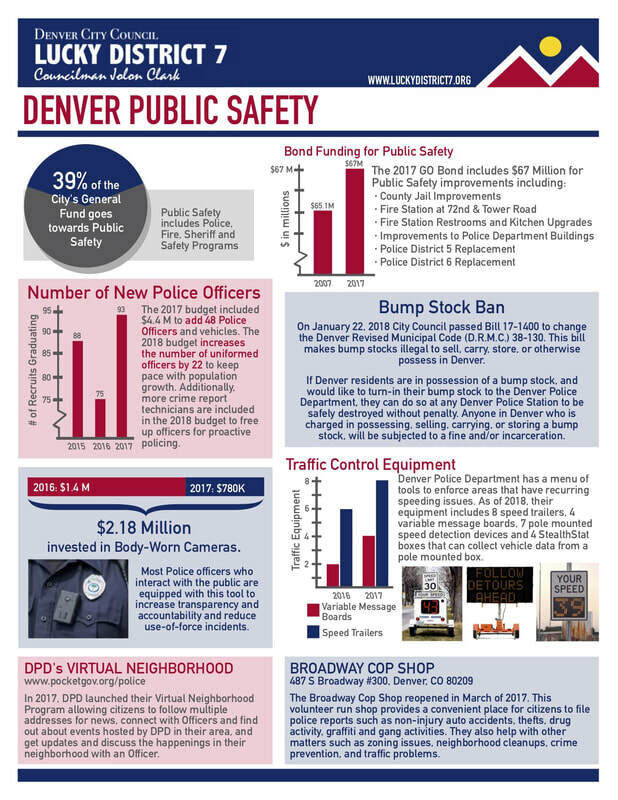 To improve safety, Denver has committed to increase traffic enforcement, enhance pedestrian education, install variable message boards, reconstruct signals at Exposition, Kentucky, Mississippi and Jewell in the summer and fall of 2019, build medians starting in spring 2019, repave and stripe roads completed in 2020, and upgrade lighting from high-pressure sodium to environmentally friendly LED. Learn more here. (Not in District 7) The former Loretto Heights campus has sold. The city is working with the developer, residents and other stakeholders to create a community vision for the site. Councilman Clark serves on the steering committee that meets monthly on the fourth Tuesday of every month from 6 to 8 p.m. Meetings are open to the public. Learn more and get meeting information here. Public Works and CDOT will implement several improvement projects along Federal to create safer environments for pedestrians and transit users, improve water quality flowing to the South Platte River, improve air quality, enhance streetscapes, and create a sense of place that will benefit local businesses, residents and visitors. The design phrase is from fall 2018-fall 2019 with expected construction to begin in spring 2020. To help pay for ongoing maintenance and improved infrastructure, the city will explore creating a Business Improvement District. Get involved and learn more here! The two-way protected bike lane along Broadway will become permanent, connecting the Cherry Creek Trail to S. Broadway businesses and neighborhoods. The project will be designed in 2019 and implementation expected in 2020. A new traffic light with pedestrian crosswalks at 5th Ave. and Broadway and Lincoln is scheduled for installation in late 2019. Learn more here. Baker was selected as the second neighborhood to go through the NTMP Action Plan collaboration process due to growth pressure, safety, transportation equity, and multimodal opportunities. The Baker Action Plan will identify and deliver 5-15 specific, near-term transportation and mobility enhancement projects, while highlighting the longer term actions. The NTMP will collect and gather community feedback and ideas on local transportation priorities, issues and enhancements which will inform the 5-15 neighborhood-scale transportation projects to be delivered late Summer/Fall 2019. 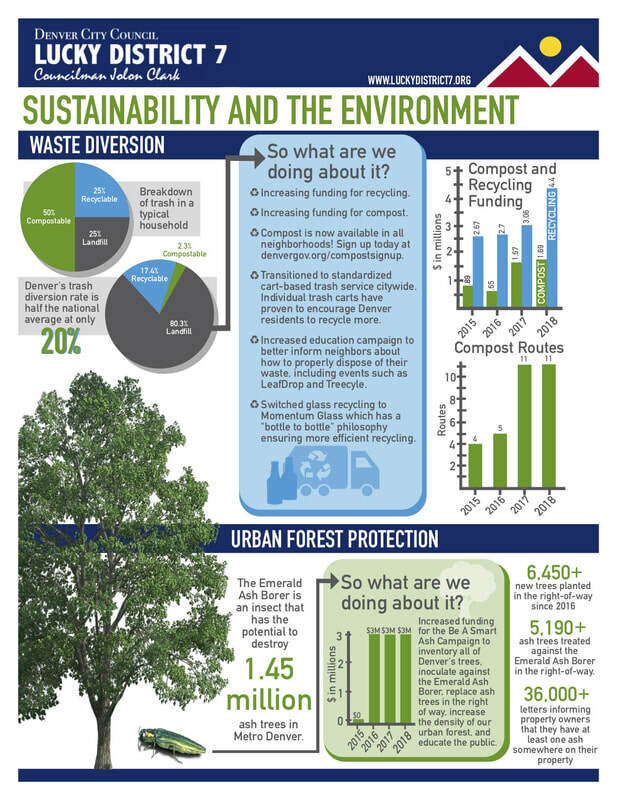 Learn more about upcoming meetings and provide input here. This year Public Works removed a non-functional bridge near Alameda & Cherokee. 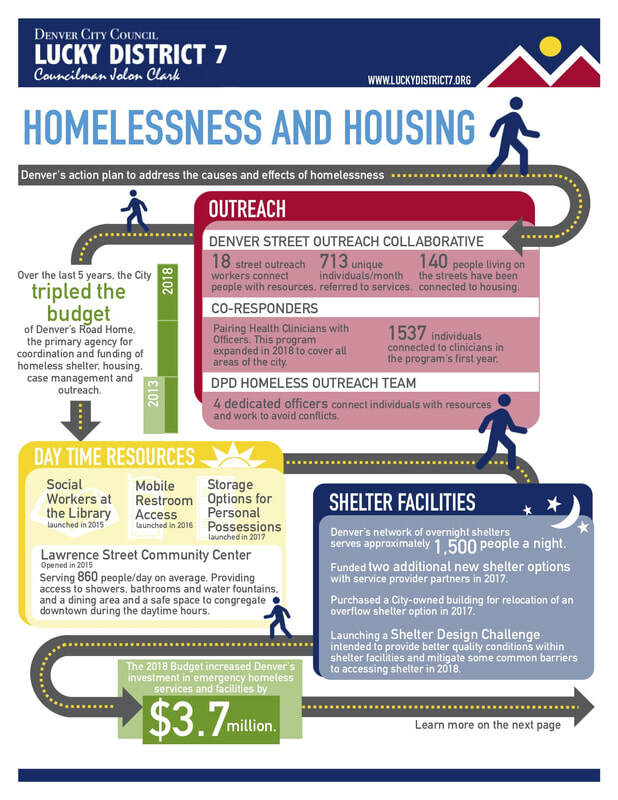 Public Works is working with residents to identify needs and connectivity issues. Please visit the website here to provide your input, receive project updates and learn about upcoming meetings! Buffalo Exchange Colorado, the Baker Broadway Merchant Association, and Councilwoman Robin Kniech worked with the Lucky District 7 office to install and raise funds for a rainbow crosswalk at Broadway and W Irvington Pl. The project is a visual demonstration of the neighborhood's spirit of inclusiveness and support for the LGBTQIA+ community. The Crosswalk won in the category of “Neighborhood Gem” in the 2018 Mayor’s Design Awards. Learn more about the project here. Bringing together neighbors and businesses, the Broadway Halloween Parade is a new annual tradition started by Councilman Clark. Stretching from 5th to Alameda, the parade shuts down Broadway and features dozens of spooky non-profit and organization floats. Hunderds of volunteers and businesses contribute to make the parade a huge success. To learn more including sponsorship options visit broadwayhalloweenparade.com. 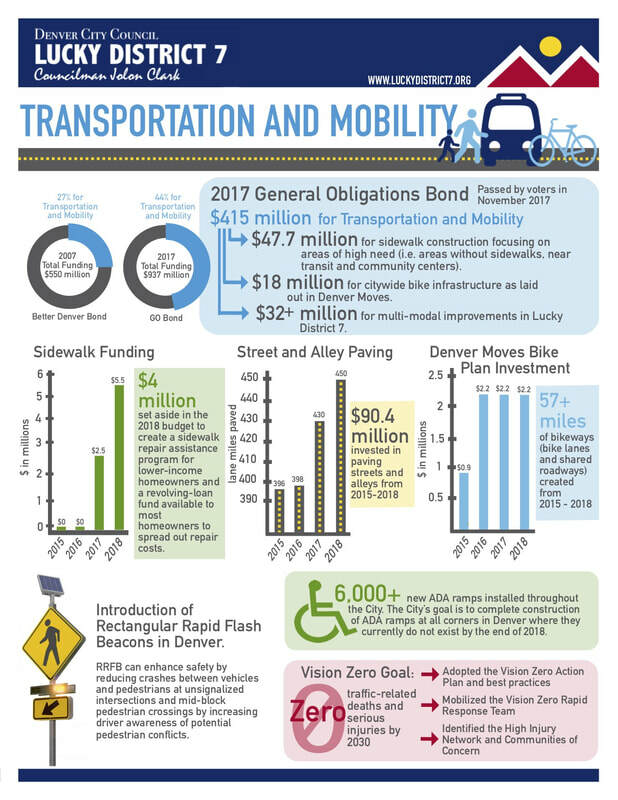 The Elevate Denver Bond Program is a 10-year, $937 million general obligation bond approved by voters in 2017 to enhance the City and County of Denver by providing critical citywide improvements to the infrastructure. Full project list and more information can be found here. A pedestrian/bike bridge at Jewell Ave across the railway, landing near the southeast edge of Overland Golf Course will allow eastern neighborhoods like Overland and Platt Park access to the South Platte River Trail and the Evans Light Rail Station. The bridge design is included in the first issuance of bond projects. Learn more here. I want to hear from you! What issues are you concerned about in Lucky District 7?